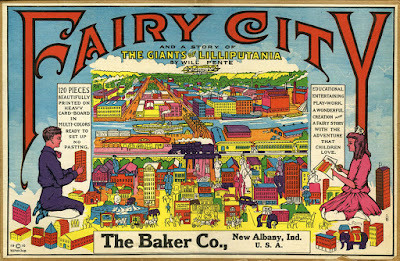 Gurney Journey: Vintage Paper Toy "Fairy City"
Vintage Paper Toy "Fairy City"
Toy collector Mel Birnkrant has many rare treasures. 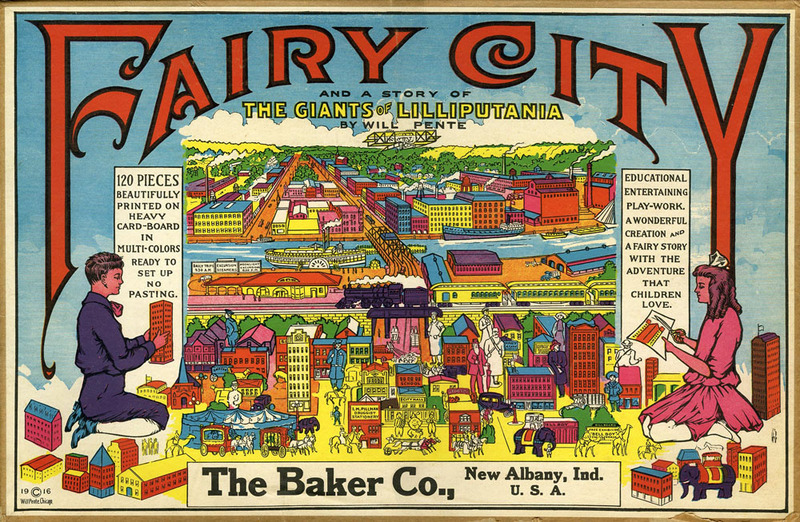 But one of the most ephemeral is a paper construction set called the "Fairy City." 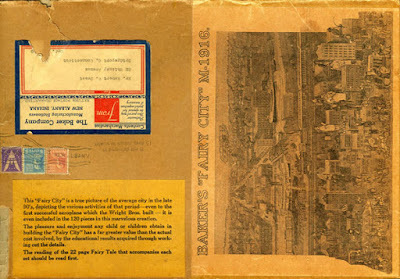 James: Baker's Fairy City seems like a rare and fragile item that would not have survived with very many copies intact. A cat or a young sibling could have trashed it so easily. Do you have the only copies of it? Mel: Yes, Jim, I believe that's true. I do! It’s not like I have asked my collector friends, as no one has ever seen this here but you. I have the bits and pieces of two and a half copies, maybe three, every one I ever saw, or I dare say, I will ever see. James: What would have been involved in the manufacturing of all the parts? It seems even more complex than the ambitious pop-up books from 20 years ago. Mel: Well, in some respects, that’s true. Its complexity borders on a miracle. First of all, the whole thing comes in a mailing envelope that didn’t make it to your video. 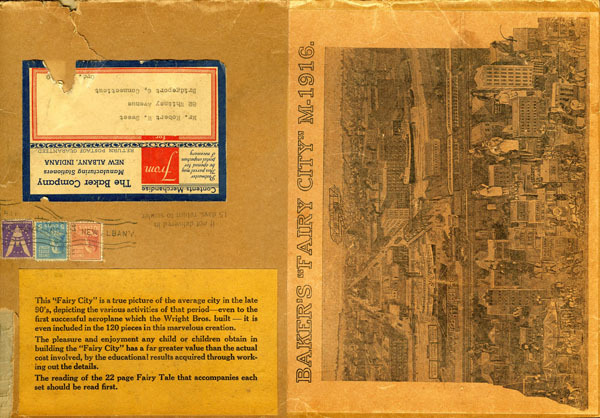 On the cover is a dismal looking photograph of the whole city set up. Inside that is a full color box. The floor plan is much more immense in person than the video shows, and on the back is a rather complex cardboard stand that folds out to hold the background upright. Jim: How do you build it? Mel: Each building is die-cut and glued, with small die-cut pieces that need to be carefully removed. The tabs on the bottom of each building need to be cut off, as they contain additional figures, trees, and vehicles. Speaking of complex die-cutting, every fold on every element that folds is scored. The characters are curious as tiny details are die cut, while all the rest are meant to be cut out with scissors. Perhaps the most remarkable element of all, is the fact that someone did just that 100 years ago. Could it have been a child? They are impeccably cut with incredible precision and skill. It boggles the mind to think that these were cut out with a pair of scissors, let alone by a child!. I could hardly do as well today with a #11 X-Acto blade, frequently replaced. 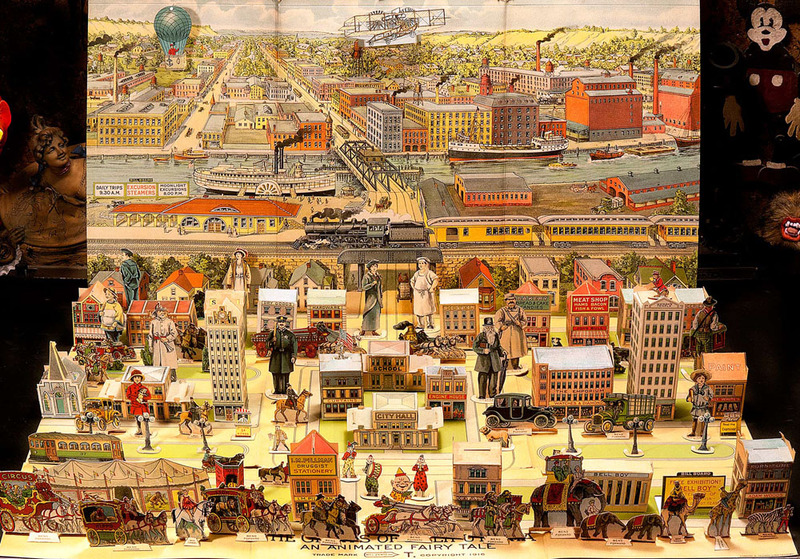 James: It would have taken patience, focus, and dexterity for a child to build such a paper city. What challenges did you face in putting it together now, and what does the set tell us about the child of 100 years ago? Mel: Interesting question; perhaps I should have read it, before I answered the one above. The most difficult aspect of assembling this recently was the fact that the paper has become so brittle. To fold it vigorously is to break it. I set one city up, once, when I first got it, over 50 years ago. Back then, it was no problem, as the paper was still fresh and new, even though it was 50 years old then. But I used some of the buildings in the showcase with Little Nemo, Many of the characters there are standing atop of buildings from the village I assembled so many years ago. Therefore to film your video I had to fold and set up several more. That is how I discovered that the paper has become so fragile. To reply to the second part of the question, I’d venture to say that there must be few children with the skill, patience, and appetite to undertake a project like this alive today. James: Did the Baker Company make other sets in this series? Did other companies make similar paper town sets? Mel: I have never seen or heard of another set quite like this, but I would like to think that such marvelous things were at one time commonplace. There were other toy paper villages, even older than this one. I have a few of them, one was called the Pretty Village. I have one of the only sets of that, in which some of the figures are intact. It too came with a floor plan, and was in a much larger scale than The Fairy City. It is quite pretty, well I guess that’s why it’s called the Pretty Village. I much prefer the nitty gritty reality of industrial USA that is portrayed by the city of your video. 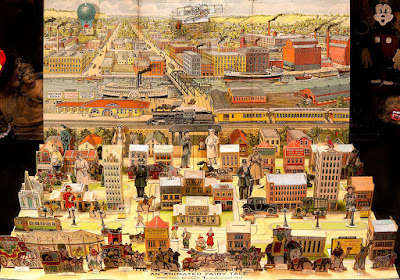 James: The town seems to reflect a magical period in American history, when the city's streets were shared by cars, trolleys, pedestrians, bicycles, early automobiles, and even circus parades. Do you believe in the concept of a Golden Age of American city life, or do you think that we just romanticize the life of previous generations? Mel: Jim, I like the way you summed that up, and I do believe I understand the answer to your question. You are seeing this as some sort of Magic Fantasy, and so it is to you and me. But I truly believe that when this plaything was created, with the sole exception of the elements of fairy tale fantasy, the Giants and the Lilliputanians, it is an accurate representation of Turn of the Last Century Reality. In fact, it was an attempt to accurately represent an up-to-date reality. The copy on the mailing package says it far better than I can. It makes special mention of the fact that Wright brother’s plane is included in the set. The flight at Kitty Hawk had taken place just two years before this toy was made. What could be more up to date than that? You are obviously having way too much fun in this world! Thank you for sharing and for creating a reality where people can do this! The toys, the tools, the technology! Thanks, Susan. I do feel lucky to glimpse some of these wonders....but all the credit goes to Mel, who had the idea for this video, and who patiently built the city. Wow...this cuts right to my heart. 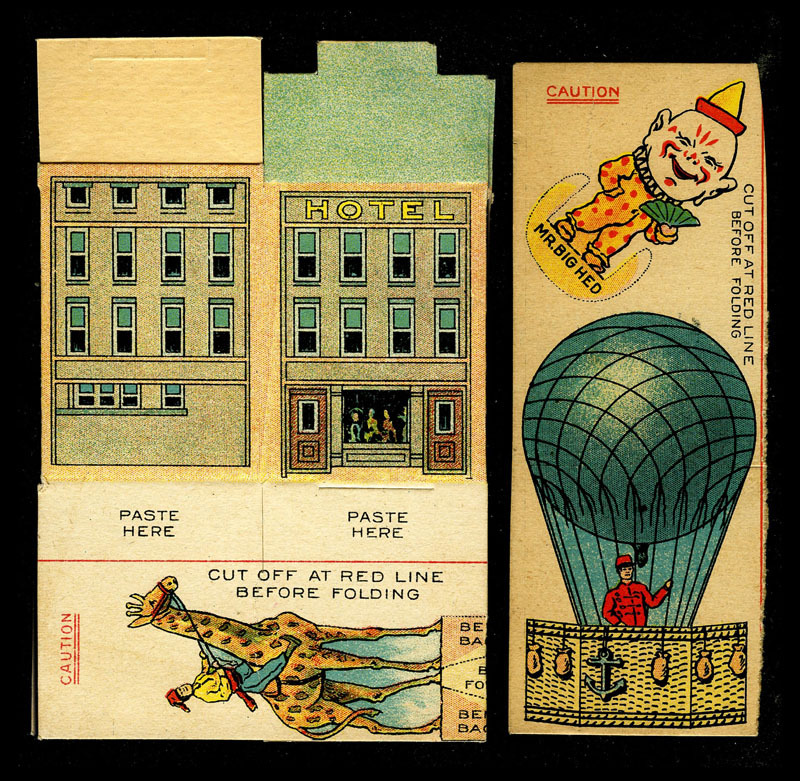 There's a charm and whimsy to antique paper toys that I love without reserve. I really appreciate your sharing this with your readers. Even though I work professionally as a product designer, my first love has always been paper construction; specifically architectural models. I've designed and made models of Washington Irving's house Sunnyside, of my hometown train station, even models for various paper modeling websites. It's my way of keeping the tradition alive even though I no longer personally sell the models I've designed. The charm of the hobby for me is to put yourself into a world of your own creation and see it in 3 dimensions. I don't know if you've ever seen the book "Paper Toys Of The World" by Blair Whitton. It's quite old though it often shows up on eBay. 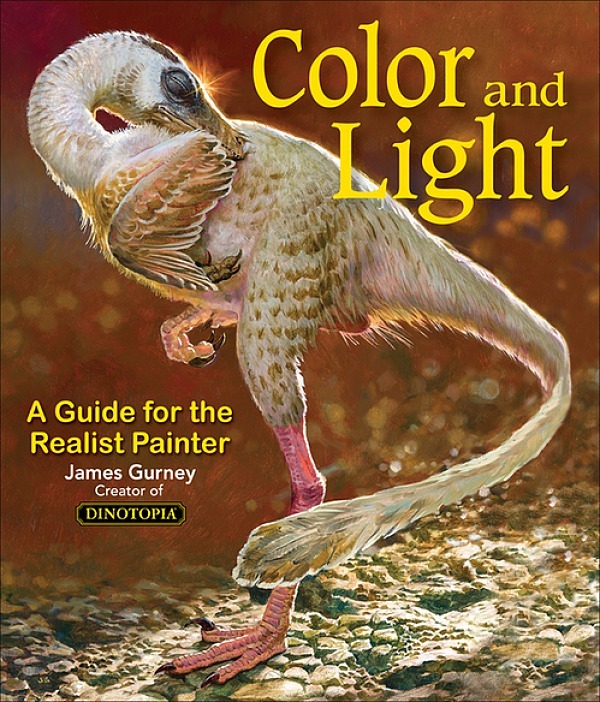 That book as been an inspiration to me for decades and its chock-full of information on toys like the one featured in this blog article. Thanks again for a really nice surprise today that really speaks to my heart. It’s not like me to chime in, but I felt compelled to respond to your comments. The marvelous book that you describe happens to be sitting right here by my side. Blair Whitton was a friend of mine, a charming charming gentleman. I ran into him frequently at fleas, long before he wrote that book. 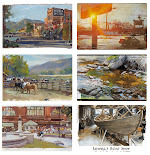 He was a fulltime collector and a sometimes dealer in the very early days of collecting in the USA. At the risk of sounding obsessed, whenever I think of him, I recall that his area of main interest, at the time, was the Schoenhut Circus. And I can’t help but remember, as if it was yesterday that he offered me the entire Schoenhut Circus Parade from his collection, for the sum of six hundred dollars, which was a ridiculously reasonable price, even back then. It was a friendly and generous gesture for him to be willing to entrust it to me. Alas, it might as well have been six million, for it was way above my means. I also realized, early on, that I would never be able to afford to cater to my every whim, and capture/rescue every treasure that pleased my eye. And so, I limited myself to Comic Characters, and I have remained faithful to just them, which was not difficult, as the category is so deep and wide. Thank you for your wonderful comments Mel. I've followed James' occasional visits to see your collection and hear your stories, always looking forward to the next one to see what interesting treats the two of you have prepared. Discovering Blair Whitton's book was a true revelation for me. I knew that paper toys and toy theaters were popular in the late 19th and early 20th centuries but the shear breadth of subject matter really opened my eyes to what could be done with simple printed paper and glue. As a result, it fueled my desire to do the same sort of work. As a result, I've focused my designs on architecture but my collecting of paper ephemera and paper models is pretty far ranging. I don't really have ways to display what I've collected, it mostly sits in bins that I occasionally sift through for inspiration. Also, for many years I would attend the International Paper Modelers convention in Virginia to hang out with individuals who had a similar passion as me though it's been a few years since my last visit. By the way, your comments about the book are very funny as it is an odd-shaped book and I can see how useful it could be when scanning! I hope you get a lot of use from it! what fun! I'd imagine with today's large format color printers and card stock we could reproduce a lot of these, no? So great to see new old treasures from your amazing place, Mel! Thank you, Jim, for doing that video! I love your vision of this peaceful world of toys. And especially how both of your visions blend. Most cordially regards to you and your wife from Berlin. This comment is directed at My Pen Name but yes, what you describe would certainly be possible. 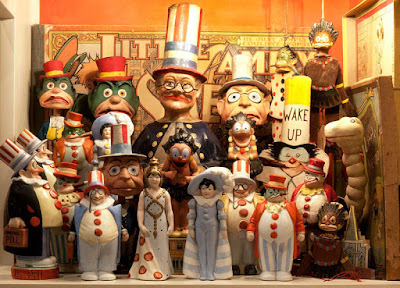 In fact, there are individuals who sell reproductions of many old paper toys for sale, especially those of the Imagerie d'Epinal line of paper toys as well as Benjamin Pollock's toy theaters. About 20 years ago, a very colorful character named Chip Fyn decided to sell paper model PDF files over the internet which would be downloaded to your own computer and printed on your own home printer on card stock. Chip ran a website called FiddlersGreen.net (which still exists and is now run by his son). Chip was a pacifist who lived "off the grid" in his mobile home in Arizona yet ran a paper modeling empire. He designed paper model buildings and airplanes in his unique cartoony pen and ink drawing style. He eventually opened his website up to other designers (including me) as long as they could mimc his particular style. It was a privilege to meet Chip on multiple occasions and work with him over the internet. Chip passed away about 5 years ago but he's a legend in the paper modeling community!